“At school, at university, when outdoors, when at home, among friends, at work, when taunted: ‘What would Christ do in my place? '” he told thousands of young people who came from all over Latin America and Chile to a youth rally at Santiago’s Maipu shrine. “I want to take the pope’s advice and not just treat this as a one-off event, but a catalyst for going out and inspiring others and breathing new life into the church. That is our responsibility as young people,” he told CNS. The meeting was filled with symbolism because Maipu shrine, formally the Basilica of Our Lady of Carmel, honors Chile’s patron saint. There was a huge statue of her on the stage, which the pope blessed at the end of the ceremony. Participants responded by shouting “chi chi chi che che che viva Chile,” a popular chant often used at soccer matches showing a love for Chile. 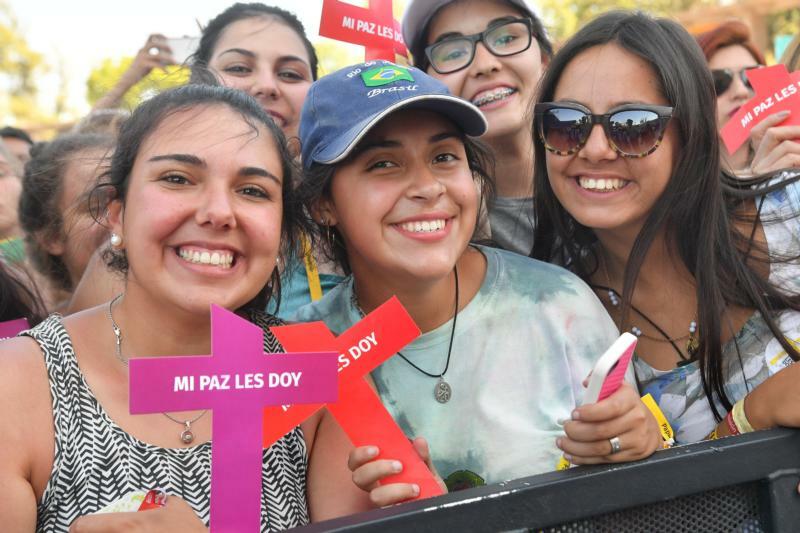 The young people presented Pope Francis with a miniature Chilean-blue cross with a red ribbon to symbolize the blood of Christ and an alliance that all of Chile is together. They also presented a white star. Red, white and blue are the colors of the Chilean flag. Later, the pope met with professors, staff and students at the Pontifical Catholic University of Chile. He told them they can contribute to fostering peaceful coexistence in the country through education. “Peaceful coexistence as a nation is possible, not least to the extent that we can generate educational processes that are also transformative, inclusive and meant to favor such coexistence,” he said. “The missions that take place each year in different parts of the country are an impressive and enriching reality. With these, you are able to broaden your outlook and encounter different situations that, along with regular events, keep you on the move,” the pope said. This evangelizing can also “overcome every antagonistic and elitist approach to learning,” Pope Francis said. “This prophetic role demanded of us prompts us to seek out ever new spaces for dialogue rather than confrontation, spaces of encounter rather than division, paths of friendly disagreement that allow for respectful differences between persons joined in a sincere effort to advance as a community towards a renewed national coexistence,” the pope said.